MEDITATION. Are you familiar with peace? Are your responses to challenging situations controlled or reactive? Could you benefit from greater focus, concentration and awareness? Have you ever been in “the flow”? You were entirely engaged and centered in what you were doing. Other things seem to fade in the background. You were in a form of meditation. Meditation is a practice of focusing your attention on one thing – the breath, a word, a phrase, a candle, a picture, a sound, a color, an experience. The process allows you to take a break from the incessant stream of thoughts flowing through your mind. It can be a practical way to investigate your inner nature through a process of self-observation, self-inquiry, and mindful action. It is about being rather than doing, something that is often very hard to enjoy in this busy world. Meditation allows you to build your self-awareness muscle through a practice of silence, stillness and simplicity – even while in motion. The discipline of meditation is over 5,000 years old and is a component of almost every spiritual tradition. It is central to systems such as Buddhism, Hinduism, Taoism and Islam. For religions such as Christianity and Judaism, it is mentioned in the core text of the Bible at least twenty times and is often integrated with prayer. No longer viewed as just a “mystical, New Age practice from the East,” meditation is even now being incorporated into medical and corporate settings as a means to promote health. A society of “multi-taskers”, we place a premium on activity and efficiency. Yet, continuous busyness can lead to lower productivity, and higher levels of dis-ease. The ancient technique of meditation has been found to reduce stress, and benefit sleep disorders, headaches, anxiety, depression, and even heart disease. Clinical studies have shown that meditation can decrease heart rate, respiration rate, pulse rate and the stress hormone cortisol, as well as increase the alpha brain wave associated with relaxation and higher levels of consciousness. This state can contribute to overall psychological and physiological well-being, as well as induce more alert reactions, broader comprehension and greater creativity. There are different types of meditation depending on the tradition. For example, in many of the Eastern practices the objective is to “empty” the mind of thoughts to induce a sense of calm. It is said that the mind is like a monkey, the way it jumps about. The goal is to tame the monkey through single-pointed attention. On the other hand, from a Christian perspective, meditation might be thought of as quiet prayer, or a prayer without petition. The approach is to contemplate on that which is good, such as scripture, to “fill” the mind. Philippians 4:8 says: “Finally, brethren, whatever things are true, whatever things are noble, whatever things are just, whatever things are pure, whatever things are lovely, whatever things are of good report, if there is any virtue and if there is anything praiseworthy – meditate on these things.” Although it can be a spiritual practice, meditation is not about a specific religion. Instead it is a method of living consciously in the moment without judgment, allowing you to receive inspiration and become more familiar with peace. One question I often get from the achievement-oriented is: “How do I know if I am successful in the meditation?” My answer is: “Meditation is its own reward.” Don’t expect flashing lights and immediate self-realization. On a very basic level, meditation has been described as “focused thinking.” If you know how to worry, you already know how to meditate. The key is to choose an approach that works for you, from a formal sitting meditation to an introspective game of golf. Just be in the experience. Rather than withdrawing from the world, meditation can help you enjoy life more fully – gaining greater clarity, awareness, health, peace and purpose. Formal Sitting Meditation – This is the foundation for many of the meditation traditions, from Transcendental Meditation to Hindu practices. Find a quiet location without distractions. Sit in a comfortable position with the spine held tall, often called a “poised posture”. It could be cross-legged on the floor with a cushion under the sitting bones inclining the pelvis slightly forward, or in a chair with the feet firmly planted on the floor. Hands can rest on the lap or be in a “mudra” or energy seal. One hand position is to have the right hand placed in the left hand, palms upwards, with the tips of the thumbs slightly raised and gently touching. Eyes can be closed, or partially open with the gaze down along the line of the nose or at your object of focus. Tongue can touch against the back of the upper teeth to prevent excess salivation while also preventing the mouth from becoming too dry. Breathe slowly and naturally. Begin to focus on your object of meditation. If it is the breath, focus on the rhythm of inhalation and exhalation allowing the breath to naturally become slower and deeper. If your object of meditation is a word or phrase, then repeat it silently as you exhale. Assume a passive attitude without judging yourself. If your mind wanders, or if you are interrupted, simply resume your focus and stillness. With practice, you will be able to tune out distractions. 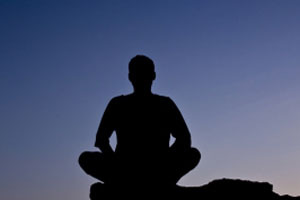 Contemplative Meditation – A form of sitting meditation, contemplation meditation – often called analytical meditation – is used in many traditions, such as Buddhism and Christianity. Assume a poised posture as above, or a kneeling prayer position. To prepare, choose a scripture or statement to reflect on. An example in Christian meditation would be: “There is no fear in love. But perfect love drives out fear.” Think about what this means to you. You may even reflect on an image that brings feelings of love. Then, close the eyes to shut the door to the outside world. Consciously pay attention to your heartbeat. Notice its rhythm. Let the breath flow in and out naturally. Imagine yourself surrounding by people who love you. Let love in. Then focus on the statement, “God is love. I feel love. I am love.” Allow this to be your mantra, repeating it silently. As you continue to repeat this phrase to yourself, feel this love permeating throughout your body. Let it seep through every cell. If you become distracted, simply begin again. Let the words emerge from your heart. Connect with the phrase. As you ease out of the meditation, reflect on the good within yourself. Reflect on the good in others around you. Continue the day with this love in your heart. This type of contemplation can be used with anything you choose. Body Scan Meditation – The body scan technique is now used in clinical settings as a part of relaxation training and psychotherapy, as well as at the end of many yoga sessions. It can help you develop a fuller awareness of the body, as well as a sense of peace. It involves lying on your back and moving the mind through different regions of the body. It usually starts with the toes and moves systematically up to the head. Breathe into and out of each region you focus on and then let go of any sensations or thoughts, allowing the muscles to relax as well. With each inhalation you’re drawing in calm, with each exhalation you’re releasing tension. As you complete the scan, dwell in silence and stillness. Then, after awhile, bring the attention back to the body as a whole. This can also be done seated in a chair. Touch Meditation – Prayer beads – also called mala or rosary beads – can be an aid to meditation. They are used in a variety of traditions including Hinduism, Buddhism, Islam, Christianity and Judaism. Although the significance of the bead and the number of beads on the string is individual to each of the religions and philosophies, all use them as a means to keep tract of repeated prayer. The uniform size of the beads and smooth surfaces assist the meditative state. The mala is traditionally held in the right hand and you move through the beads, one by one, in time with your inhalations or repetition of your mantra. Simply pausing on a bead is an act of meditation. If you want a similar effect but don’t have an actual mala, you can use one or two smooth, rounded stones in the same way passing them from hand to hand as you repeat a mantra, or word such as “peace”. Movement Meditation – Movement meditation combines breathing and gentle flowing movements to create a meditative state. Yoga and T’ai Chi Ch’uan are deliberate forms of meditation in motion, linking breath with each movement. A dynamic form of meditation that is even more expressive is spontaneous dance or “trance dance”, allowing the body to move naturally for a period of time and then slowing down to find stillness. This is particularly accessible to people who may have repressed emotions or initially find it hard to sit in silence. This practice can be found in many indigenous cultures. Walking Meditation – Walking meditation is a form of mindfulness, also called “vipassana.” It is becoming deeply aware of the present moment and fully experiencing it. To practice a walking meditation, focus your attention on each foot as it connects with the ground. Bring your attention to the actual experience of walking. Notice the sensations in your legs and the changing pressures on the soles of your feet. Notice the texture of every surface you walk on. Keep your gaze in front of you and try not to look around. Concentrate just on your immediate steps. This is a very accessible form of meditation for those who find it challenging to sit for periods of time. Eating Meditation – Another example of mindfulness meditation is an eating meditation. Start the meal in silence, taking a few rounds of deep breaths. Give thanks for the meal. Then, examine the food you’re about to eat. Look at it as if you’ve never seen it before. Note the color, texture and smell. Put it in your mouth and focus on how it feels on the tongue. Slowly begin to chew, focusing on how the teeth sink into it. Chew as thoroughly as you can and finally swallow. Notice how it feels going down your throat and into your stomach. Practicing eating meditation can change your relationship with food and even help you lose weight! Set a time – Set aside a certain time for meditation each day. Start where you can, Even 5 minutes is beneficial. Then gradually expand it to 30 minutes or more. Try to meditate the same time every day – either in the calm of the morning, the quiet of the evening or in the middle of the day when you can sneak away from the noise and activity around you. The morning is good because it can help orient the rest of the day’s activities. Choose a time and place that will be free from distractions. Choose a form – If you are new to meditation, you may try different types to see what works best for you. The intention is to find your own space of inner stillness. You may even find that activities like golf or running are your form of meditation. If you want more instruction, practice breathing, meditation and visualization with the Power Living: Mini-Escapes CD. Suspend judgment – Meditation is about transcending the ego; letting go of the old self so the new self can come in. Therefore, don’t chastise yourself or judge the meditation session as good or bad. There is no right or wrong. Remember, just be in the experience. Be consistent – The benefits of meditation come from regular practice. The experience will get richer and deeper as you go along. I sit in a comfortable position, close my eyes, take a deep breath and slowly exhale. I focus on one thing. I calm my thoughts to just be. At any time, I can go within to the quiet of my soul and receive guidance and strength, and hear messages of hope and healing. Copyright Teresa Kay-Aba Kennedy. Power Living® Column Vol. 5.03, originally published Week of May 18, 2003; revised June 2008. Teresa Kennedy has written over 70 “The Power of…” columns that are a part of the Power Living® Empowerment Series and available for syndication. Call 212-901-6913 for more information. ADD YOUR VOICE: Share your stories about the power of meditation by posting a comment below. Experience all of our articles and videos on yoga and meditation. 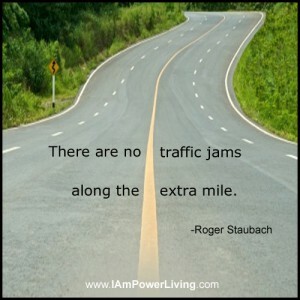 Do you want to step up your energy, reduce stress or tone your entire body? Get private yoga training.